Offer travellers a variety of options from culture, historical legends to sea-based, city attractions, etc. Located off the southern coast of Vietnam, comprising of 16 islands, Con Dao archipelago is reputed for immense natural beauty, deserted sandy beaches and extensive coral reefs. The main island Con Dao is 76 km2 with the local population of approximately 5,000 people. The total length of the coastal line is 200km, untouched by development, featuring some of the best beaches and hidden lagoons in Vietnam and Asia. Nearly 80% of the island is entirely a National and Marine park which makes it well preserved and protected. This is the best scuba diving destination in all of Vietnam with healthy soft and hard coral. It is considered by CNN Travel as one of a few paradisiacal destinations in Asia that remains unspoilt. 45-minute scheduled flight from Tan Son Nhat International Airport, Ho Chi Minh City (SGN – VCS). 9 flights/day. 55-minute flight from Can Tho City (VCA – VCS). • PRIVATE JET: Each flight is crewed by two highly experienced pilots, supplemented with one flight attendant. Choices of King Air 390 or Legacy are available. • PRIVACY: Your privacy is paramount! All the travel itineries and details will be kept secret. Private terminal ensures your trip is ultra-confidential. • TAILOR-MADE FLIGHT: With the purpose of crafting every air travel experience based on individual’s availability, we ensure that the complete service operates to your schedule. SEAMLESS EXPERIENCE: Aviation experience is taken to a higher level with the luxurious personalized service offered to meet indidvidual’s need. • EXCLUSIVE AIRPORT TRANSFER: Get to the airport on time with our luxury vehicle and a professional driver that can be arranged upon request. Nestled in a remote area of unspoilt natural beauty - a protected National and Marine park, looking out at the blue sea, curve of the bay, sheltered amongst green forest of Lo Voi Mountain. Unsullied, off-the-beaten track tranquillity allows guests to reconnect with nature, achieve mindfulness and release from daily hustle. The resort is reputed for its one mile-long stretch of immaculate private beach. Top picked by some selective and rare green sea turtles as a destination for laying eggs. Being the first five-star resort on the island makes travellers to be tiptoe with curiosity to pay a visit. 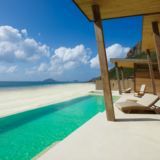 SIX SENSES CON DAO | RESORT OVERVIEW Set on a pristine beach, the resort is contemporary in design, embracing the essence of a traditional fishing village with elegant architecture. Dining In â&#x20AC;&#x201C; The Villa Your memories will include an out-of-the-ordinary dining experience when we organize a private dinner in the privacy of your villa. Personalized setup and decoration can be arranged. The only limit is your imagination. Good for 10 persons. EXCHANGE DAILY BOARDROOM FOR BREATHTAKING OCEAN VIEW Pep up your business meetings and events with fresh energy and inspiration amid the spectacular natural surroundings. CHANCE TO DISCONNECT TO RECONNECT Completely disconnect from the hustle and bustle of the daily life to indulge in a soothing and inspirational ambiance of the paradisiacal island. 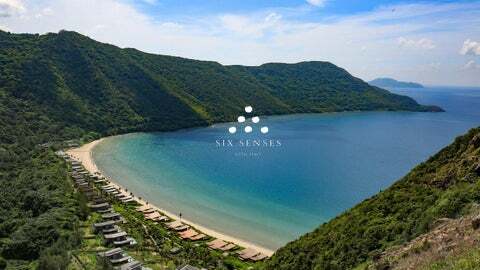 OUT-OF-THE-ORDINARY SERVICE Six Senses Con Dao also undertakes to provide the best meet and retreat experience to delegates, customized based on individual’s preference. …AND A BIT OF FUN While private villas cocoon you in luxurious seclusion after your meeting time, alluring beaches beckon sun-worshippers and watersports enthusiasts. A host of activities are also on hand to satisfy the most discerning of tastes. Catering for up to 40 delegates, “Sense of Gathering” is designed to suit different types of meetings from a corporate brainstorm, exclusive celebrations to formal gatherings with a strong focus on tailor-made service based on individual’s preferences. It also features a breath-taking view of the ocean with a variety of tea-break themes and modern audio-visual equipment. Con Dao Local Life Tour Feel like discovering the island and finding out what Con Dao daily life is about? Travel across the island with our guide, through the back roads, small dwellings and local agricultural plots that are peppered with livestock. Con Dao Historical & Prison Tour This tour explores the rich history of Con Dao and will delve into its darker side. A series of prison systems were constructed throughout the 113 years of colonization, during which time many thousands of prisoners where interred here. Trekking Tour Immerse yourself in Con Daoâ&#x20AC;&#x2122;s nature while hiking through the rain forest and try to spot the endemic animal species such as Con Dao Giant Black Squirrel, Macaque and the Curved-toe Gecko.